This article will primarily depict my experiences over the years with Gymnotorax Tile, but can to a very high degree be applied to any of the so called freshwater moray eels. I would like to start by giving a description of my experiences with G. Tile. You often hear that these fishes are hard too keep and usually dies after a few months, are hard to get to eat and usually are so weakened when you get them that they are beyond saving. I have kept this species for a few years in different aquariums and have found that it isn’t a hard fish to keep if you just meet a few small demands. If these demands are met they eat just about anything and even eats food out of your hand above the water surface. That is, if you are brave enough to risk that they bite you by mistake (and take my word fore it, they care a mean bite). The rumours about them being weakened by transports are usually just rumours. By my account these fishes can recover from just about anything. The “secret” of keeping morays are to understand that these animals are very easily stressed if not given the right environment. And if they feel stressed they’ll stop eating and slowly fades away over 2-3 months, which explains many of the rumours surrounding these fishes. First of all I would like to stress that these fishes are not really freshwater fishes, even if they can be found from time to time in freshwater. They are much rather kept in brackish waters. This said I should add that it is possible to keep these fishes in freshwater more permanently, however the fishes are much more sensitive in freshwater and therefore this is not recommended if you don’t have extensive experiences with these species and even then brackish water is preferred. I recommend a big aquarium, at least 540 L/120 Gallon for these fishes which grows to about 60 cm. The aquarium should be decorated with a lot of hiding places. However I will return to decoration later. 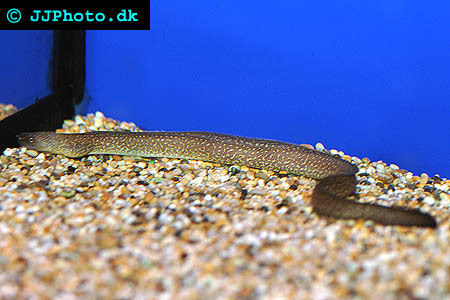 Gymnothorax tile is despite being called a freshwater moray eel best kept in Brackish water. If the species other demands are meet feeding freshwater moray eels shouldn’t give you any problem, they accept most kind of live and frozen food. They usually don’t accept pellets. A varied diet is as always preferably. I usually feed my eels a diet based on frozen shrimp (the kind you buy in your grocery store) and frozen fish that isn’t to fat. Once a while I’ll give them live fish. Don’t be surprised if the fish survives a few days, sooner or later it will become food. I vary the diet a little more with different meat, crayfish etc, just use your imagination. However don’t feed the eels pork, since it’s too fat. It’s a bit tricky to find good tank mates to morays, since they eat anything small enough, are easily stressed and therefore can’t be kept with too aggressive species and are brackish water species which further narrows the field of potential companions. 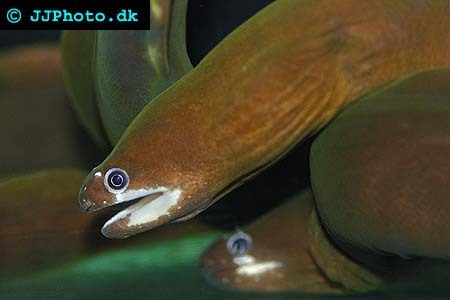 First of all I recommend you to keep more then one moray in your aquarium. They are not aggressive towards each other and often share caves which give a nice touch to the aquarium. However you might still want to have some other species in the aquarium and I would then like to recommend bigger dats who usually don’t hassle morays and maybe scats, monos, or puffers. Another possibility is plecos/ancistrus species. Morays don’t eat ancistrus if they are too big to be swallowed in one gulp. Other larger eels are another suggestion. Use your imagination but remember what I stated above and be patient if trying new species, just because the morays haven’t eaten a fish in a few days doesn’t mean they aren’t going to. I recommended that you wait at least 14 days before deciding that it safe and get more specimens of a species. I would also like to remind you that if the moray or any other fish for that matter have grown up with a fish and don’t eaten it won’t mean that they won’t eat another new fish of the same species and size. A sometimes hear people recommend to keep Tiger barbs, Danios, with this species, however I would like to discourage this. My experience is that these fishes always end up in the morays in a few weeks. The most important thing to remember when you decorate is to create a lot of hiding places and narrow caves. I also promote having plants in the tank since plants create dimmed corners and produce even more hiding places and calms the fishes down even further. I recommend using anubias species and java fern that don’t have to be planted in the soil and that creates good hiding places since they have a bit harder leaves. These plants also tolerate slightly brackish waters. Below you can se the tank setup I usually use. The aquarium in question is a standard 540 L.
The green colour represents plants, the lower left corner is planted with anubias which grows to about 20 cm and the other green spots represent java fern. I usually also have small anubias plants growing on the rocks. I try to use rocks of different height and make sure it’s never is more the maybe 10 cm between the different rocks in the background. I also put plants in the bigger spaces to make it feel safer for the morays. Always try to have at least two, preferable three larger cave systems. 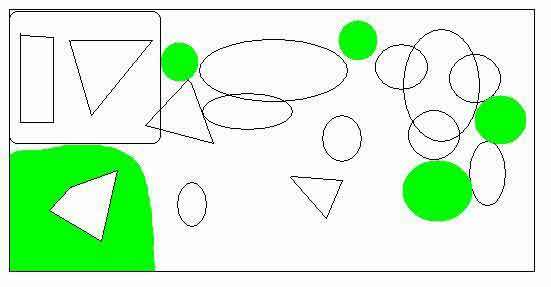 In the pictures above you can se this illustrated by large rocks laying on small rocks. If you want to improve your morays living conditions even more you can put a few PVC pipes in your tank in different sizes, large enough for your morays. However if you have built good rock formations this isn’t necessary. The importing thing is to create a lot of god hiding places, how you do this is less important, if you like sunken model ships, go fore it, just don’t use anything toxic. I would also like to warn about using roots in your morays tank since this will effect water conditions in a way that is negative for morays. Freshwater moray eels can be a very pleasant experience if you are willing to meet their demands. I find healthy morays a beautiful and interesting addition to any aquarium which meet their requirements and it’s a pleasure to see them lurk in there caves. The fact that they after a little training (1 week) elevates large part of their body over the waters surface to take food out of your hand doesn’t hurt either and makes a nice trick for guests. And since this fishes if well taken care of live to be 35 years old they might become a long time acquaintance. But don’t take my word fore it, try keeping a moray yourself, but only if your are willing to give them the environment the require. Otherwise your experiences most likely become disappointing and ads to the rumours surrounding these fishes as being impossible. Echidna rhodochilus should just like other “freshwater moray eels” be kept in brackish water.